Lightly toast the nuts in a dry frying pan until golden, then crush in a pestle and mortar and set aside. Put 1/2 tablespoon of the sesame oil into a frying pan on medium-high heat, and add the beef, breaking apart with a wooden spoon. Mix in 1/2 tsp each of dry chilli, garlic and ginger powder from your spice rack whilst stirring. Stir-fry for 5-8 minutes to brown and crisp. Mix together the remaining sesame oil with 1 tbsp ponzu or soy and a squeeze of lime. 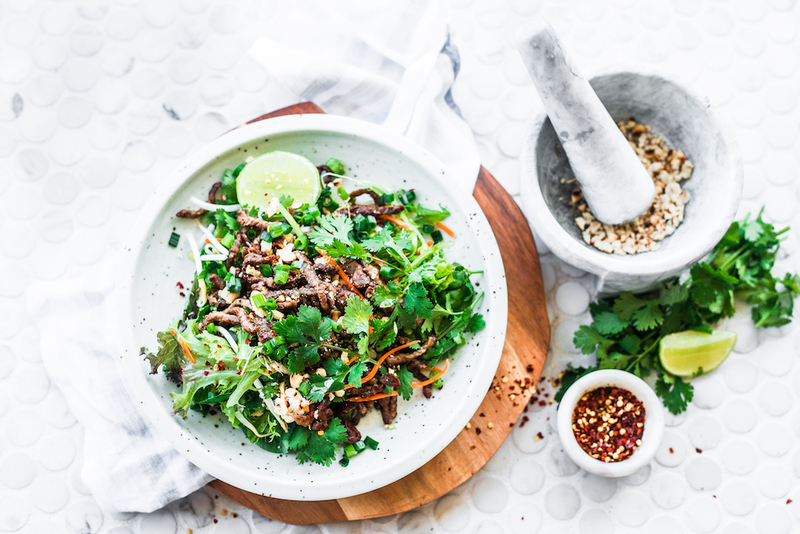 Load up your plate with salad, then sprinkle over crispy beef, spring onions and crushed nuts. Finish with a sprinkle of chilli flakes (optional), pour over the dressing, and serve with a wedge of lime.